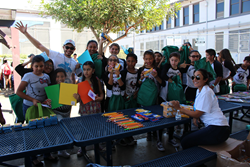 The Dream Builders Project, a Los Angeles-based non profit, partnered with After School All Stars to donate more than 200 backpacks filled with school supplies to children in East Los Angeles. Having access to new school supplies can make a difference in the success of a student's school year. Giving back to the young generations is our investment in the future. The Dream Builders Project donated school supplies to more than 200 children this past Saturday, September 24th in Los Angeles for their annual Back to School event. The Dream Builders Project partnered with After-School All-Stars Los Angeles and two other organizations to supply more than 200 students with new backpacks filled with a variety of school supplies, including folders, notebooks, writing utensils, mathematical equipment, as well as other educational necessities. At the Back to School event, there was musical performances, a popcorn machine, and informational stations for the parents. The children competed in an obstacle course, made crafts including backpack tags and, and did musical performances. The Dream Builders Project received generous product donations from local and national companies and organizations including Bazic Products, Right to Write, and many other supporters. To get involved with the any of our upcoming events, donate or sponsor, interview founder Mayer Dahan, or if you would just like more information about The Dream Builders Project, please contact Lindsey Conger on (323) 536-9246 or pr(at)thedbproject(dot)com.